MIDDLE EAST PEACE TREATY UPDATE! (Peace Treaty) will be a sign of the End Times being ushered in. It is an End Times Peace Treaty which will be brokered by the Antichrist. It will involve Israel and it's neighboring Countries. It is a False, 7 year Peace Treaty which, according to our Bible, brings about the final 7 year Tribulation Period which ends with the 2nd coming of our Lord Jesus Christ! Over one hundred high ranking security officials, including two former Mossad heads and three retired police chiefs, issued a letter to Prime Minister Benjamin Netanyahu, urging the Israeli leader to strive for peace and to work towards relaunching negotiations with Palestinian Authority President Mahmoud Abbas, with the intent of reaching a viable, two state solution. 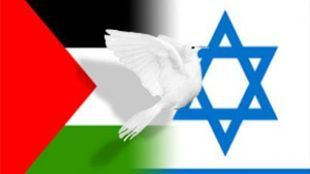 In the letter, which is being published as an advertisement in several Israeli newspapers, the officials further contend that Israel has the ability to reach a comprehensive peace agreement not only with the Palestinians, but with a number of key nations throughout the Middle East as well. Amnon Reshef, a retried Major-General and former Commander of the Armored Corps, said he initiated the letter following Israel’s fifty-day-long summer war with Gaza-based terror group Hamas. “During Operation Protective Edge, I saw a respectable cooperation between Israel and the moderate Arab states — Egypt, Jordan, Saudi Arabia,” Reshef said during an interview with Channel 2 News Friday. Reshef added that he believed the letter was not political by nature, but was rather born out of a deep concern for the security and for the future well being of the Jewish state. Retired Major-General Gabi Offir, who also signed the letter, asserted that the Israeli government could not afford to continue ignoring the Palestinians in the West Bank. He added that Israel must work to strengthen and rehabilitate the Palestinian leadership, according to Channel 2 News. “The Palestinians are still here, the PA is still here… but we cannot keep the corpse that is the Palestinian Authority in its current state,” said Offir, a former Commander of the Home Front Command. The publication of the letter will coincide with a scheduled meeting between top US diplomat John Kerry and chief Palestinian negotiator Saeb Erekat on Monday, for discussions on ways to advance a Middle East peace deal. The Palestinian Authority has said it intends to present a resolution to the UN Security Council shortly, demanding a timetable for an Israeli withdrawal to the pre-1967 lines and the establishment of a Palestinian state — a move the US would likely veto given its traditional insistence on Israeli-Palestinian negotiations for statehood. Peace talks collapsed in the spring amid bitter Israeli-Palestinian recriminations. Hamas’s refusal to disarm in Gaza following this summer’s conflict, further dimmed peace hopes. Kerry would also discuss “lowering tensions in Jerusalem” with the Palestinian team, Psaki said. Minor clashes erupted in the West Bank Friday after weekly Muslim prayers, while security forces deployed heavily around Jerusalem’s flashpoint Al-Aqsa mosque in the Temple Mount compound. Police reopened the compound to Muslim worshipers having closed it Thursday after a Palestinian man, Mutaz Hijazi, the main suspect in the Wednesday shooting of Rabbi Yehudah Glick, was killed in the mixed Jerusalem neighborhood of Abu Tor. Israel ordered Thursday’s rare and brief closure of the Temple Mount compound, sacred to both Muslims and Jews, due to fears of further violence. RELATED RECOMMENDED ARTICLE: Former President Shimon Peres delivered a fiery and passionate speech on Saturday night, one less politically correct, demanding peace. 1 Thessalonians 5:3 "While people are saying, “Peace and security,” destruction will come on them suddenly, as labor pains on a pregnant woman, and they will not escape."